If you read newspapers or magazines you surely have seen advertisements for hearing devices promising better hearing for very little money. Some of these ads admit the device advertised is not a hearing aid, yet they promise the device will enhance speech understanding. For those who have hearing loss this sounds like a dream come true. Is it possible to enjoy better hearing with an inexpensive mail order device? The answer to this question depends on your unique hearing communication needs and the benefits and limitations of the device. The Food and Drug Administration (FDA) regulations define a hearing aid as “any wearable instrument or device designed for, offered for the purpose of, or represented as aiding persons with or compensating for, impaired hearing” (21 CFR 801.420). The FDA regulates hearing aids as Class I or Class II medical devices available from licensed providers like audiologists or hearing instrument dispensers. Hearing aids can be customized for fit as well as function for those with hearing loss from mild to profound degree. At present almost all new hearing aids work on a digital platform and are programmed by an audiologist to meet prescription guidelines for the patient’s hearing loss. There have been great strides in hearing aid technology in recent years. Hearing aids have been capable of classifying sound in the environment to activate automatic noise suppression for over a decade. They now are capable of automatically increasing the level of conversational speech when noise is in the environment. This represents only one of the many features that digital hearing aids offer to enhance audibility of speech as well as music. Most hearing aids are manufactured by one of the following companies: Sonova (Phonak), GNResound, Sivantos (Siemens), William Demant (Oticon), Starkey, and Widex. In 2009 the FDA provided the first guidelines to distinguish a PSAP (Personal Sound Amplification Product) from a hearing aid. These guidelines define PSAPs as electronic devices designed to assist listening in specific situations by amplifying environmental sounds. PSAPs are designed to be useful for normal hearing individuals to hear soft sounds during activities like bird watching or listening to TV. In 2013 the FDA added the stipulation that PSAPs could not be marketed to those with hearing loss by making claims that these devices could compensate for hearing loss as they are not regulated as a medical device. For those individuals who have a mild hearing loss, a PSAP may be useful in certain situations, but they are not designed to be used in all listening situations the way hearing aids are. A Free Live Hearing Aid Demonstration: Patients are given the opportunity to see and hear the newest hearing aid technology from a wide range of manufacturers prior to deciding on a hearing aid model. Unbundled Hearing Aid Pricing: Patients who are experienced hearing aid users or those who do not require as much care from the audiologist do not have to pay for the cost of care with purchase of the hearing aids. We offer three levels of hearing aid care to customize our service to meet your needs. Verification of Hearing Aid Performance using Real Ear Measures: All patients fit with hearing aids are tested to ensure that the hearing aids are providing the patient with prescribed amplification for soft, average and loud speech. The response of the hearing aids to loud sound will also be tested to ensure that maximum output settings are safe for the patient. Validation of Care: Our patients are asked about their communication goals and listening needs at the outset of care. Once audiologic management of hearing treatment ends, patients are asked for their opinion regarding how well their listening needs have been met. A hearing treatment program cannot come to you in a mail order box. 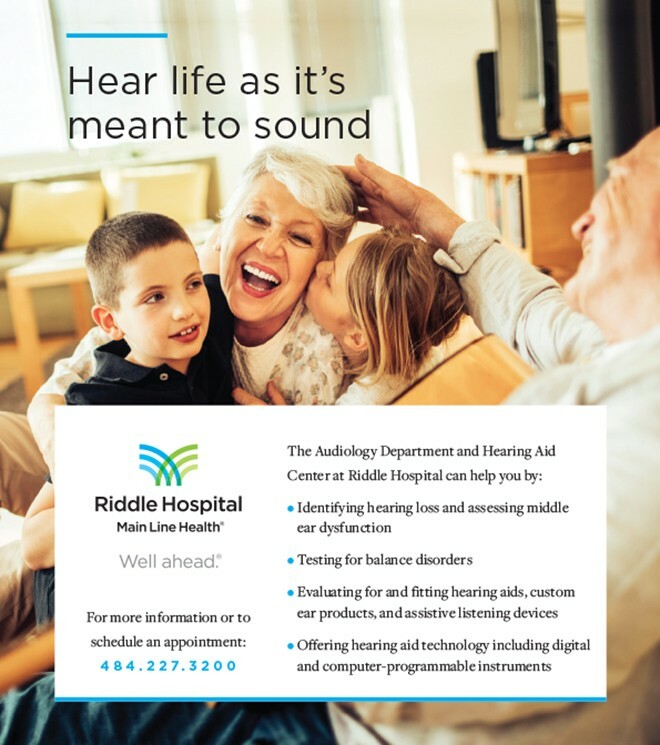 The audiologists at Riddle Audiology Main Line Health will give you the care you need to meet your goals for better hearing. A word to the wise: It is better to keep your hearing healthy rather than treat a hearing loss! ← Previous Story We Focus On You!